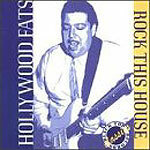 CD review: "Rock This House"
The late Michael "Hollywood Fats" Mann was a fixture on the Los Angeles  and indeed entire West Coast  blues scene in the late 1970s. The reissue of his only album, cut in 1979, shows why Fats' guitar work is so highly regarded and still talked about years after his death  despite this recording having been mostly out of print in the intervening years. Fats played a roots-oriented style of blues, with a fat fuzzy tone on guitar. His lead is as notable for his percussive fills as for the funky, imaginative solo lines. The music was modern West Coast blues, upbeat and uptempo  much like that of James Harman and Rod Piazza, both of whom Fats played with during his career. It's electrified boogie  not too heavy, not too amplified, with a strong emphasis on musicianship and strutting one's chops. The backing band, led by vocalist/harpist Al Blake, has front-line talent. Blake's nasal vocals are a perfect foil for Fats' guitar. Fred Kaplan provides both great rhythm support and soulful fills on second guitar. The rhythm section of Larry Taylor (bass) and Richard Innes (drums) is rock-steady, giving Fats the structure he needed to take off on guitar. This is a strong, listenable album by an influential West Coast blues figure; Black Top Records deserves credit for making it available in CD format.